Currently a stay at home mother to one beautiful baby girl, K. McKinley writes in what little free time she has, and is pursuing a career as a full time writer. She lives in Raleigh, NC and has had various jobs in retail and customer service. She watches too much TV and one fall her TV schedule grew to be so large that she had to create an Excel spreadsheet to organize everything. K. McKinley enjoys writing what she wants to read. Stories with strong female leads and lots of fantasy. 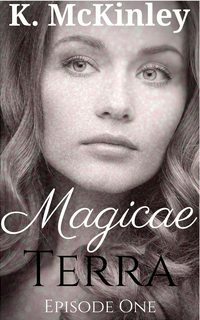 She’s finished the first season of Magicae Terra and is thinking about writing more, as well as expanding the universe. In an attempt to reassure you, most writers are introverts by preference. No worries, there. Second, I like cornbread. And writing, and writers, and I never, ever graduated from college. I will admit to having put several years’ investment into three different colleges and universities just because they offered courses that interested me. In all truth, other than that piece of paper they give you when you graduate, the only thing you can take away from a decent education is the knowledge of how to research and how to use a library. I already knew that stuff, and I dare say you do, as well. i wish you all the very best of luck, Kristine. The world can always use another writer. Thanks so much for the follow. Please feel free to share your comments or thoughts anytime. Take Care. Hi Kristine, I nominated you for “The Very Inspiring Blogger Award”. Here: http://wp.me/p2YjS7-3Z Cheers!